The innovative Pull-N-Pak allows customers in your produce or other sections to dispense bags one at a time. The rack delivers a pre-opened bag every time right down to the last bag on the roll. 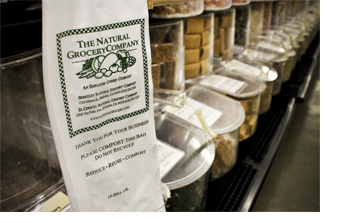 This helps improve the customer experience and can decrease bag waste by up to 20%. Made from Mater-Bi®,The Pull-N-Pak Produce Bags are 100% compostable. Mater-Bi® is a bioplastic composed of corn starch and other renewable materials. Pull-N-Pak bags are a great alternative to the polyethylene based plastic bags. The design of the bag, with the wide opening, makes it easy to put large wet items into them. 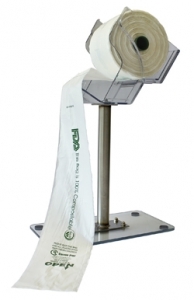 The patented sealed bottom creates a strong leak proof seal.Pull-N-Pak bags are only available as a preprinted and custom item. The Pull-N-Pak patented dispenser has a unique narrow profile and can be mounted just about anywhere or attached to a free standing base, making it easy to accommodate in any produce display. Additionally we provide the dispenser free with any purchase of the produce bag. These bags are only available with custom printing. Minimum order is 180 cases, each case contains 1920 bags (6 rolls of 320).